Quarterly report from Daft.ie also shows that average rental asking price on largest property website fell slightly over course of 2011 – but is increasing in Cork. THE PERCEPTION THAT there are a lot of empty rental residential properties crying out for a tenant seems to be belied by the latest quarterly report from Ireland’s largest property website, Daft.ie. There were almost 1,000 fewer rentals available in Dublin at the end of 2011 compared to end of 2010 – the drop was 5.7 per cent there. The report, which is based on rental prices and properties to let on Daft.ie in the last three months of 2011, also shows that there has been a small fall in the average rental prices asked in Galway, Limerick and Waterford year-on-year. In Dublin, average rental asking price stayed almost static while in Cork, it saw an increase year-on-year from 2010 to end of 2011. Ronan Lyons, resident economist at Daft.ie, said that the slight increase in Dublin and in Cork “suggests underlying demand from a build-up of first-time buyers”. 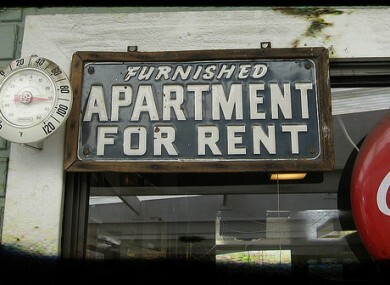 The average rent nationwide is now €821 – a fall of 0.7 per cent over the course of 2011. When focusing on Dublin specifically, the report finds that rental asking prices rose in Q4 in the city centre, fell in North County Dublin but pretty much stayed the same in all other areas of the greater Dublin area. However, the overall cost of rental accommodation has fallen dramatically since the peak of the boom (end of 2006) by between 25 per cent and almost 30 per cent in all areas across the capital. Note: Daft.ie is part of Distilled Media Group. Journal Media Ltd has shareholders – Brian and Eamonn Fallon – in common with Distilled Media Group. Email “Number of available rental properties hits three-year low”. Feedback on “Number of available rental properties hits three-year low”.